Detroit’s population decline means higher rates for water customers. Less consumption can often lead to higher rates. Photo: Angela Anderson-Cobb. Flickr. Editors note: This is the second of a two-day series on Great Lakes water rates. Yesterday: Survey shows water-saving trend in rate structures. Many Great Lakes cities are discouraging water use by setting conservation water rates. But utility providers can lose money if rates aren’t set correctly, said Jason Mumm, president of StepWise Advisors, a consulting company that specializes in water and sewage rates. That’s because rates must cover the costs of doing business such as maintaining pipes and offering administrative services. “With the fixed monthly charge, those are the kinds of costs that we are trying to recover – those overhead costs of the system,” he said. Smaller systems with fewer users have to charge more to cover costs, Mumm said. Larger, regional systems are better able to handle the costs. That’s why the United States Environmental Protection Agency encourages regional water partnerships, said Phillippa Cannon, a media relations spokeswoman for Midwest region of the EPA. 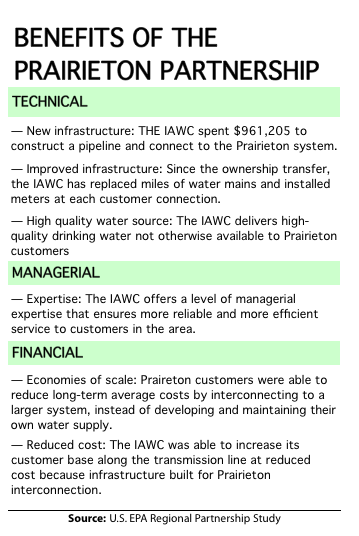 The Prairieton Water Co. served approximately 700 people in western Indiana before it merged with a larger water provider in 2000 to ease costs, according to an EPA case study on the water system partnership. 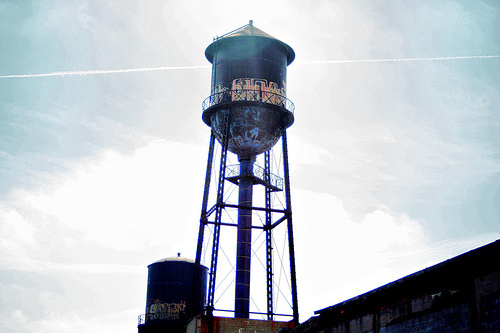 The small, private company faced a diminishing water supply and citations for high nitrate levels. A partnership with the Indiana American Water Company, a private water utility serving 700,000, allowed the company to install water meters and set conservation water rates, according to the study. “This shift toward full-cost pricing helped customers see how they were using water and created an incentive for them to use water more efficiently,” according to the study. Utilities also have to be careful with block rates, which increase the more water is used, Mumm said. “If your first [block] is set lower than the cost of service, every dollar your making is losing money,” he said. That’s because the goal is to get the second block of users to stop using that water. “Not good if you depend on that tier to make money,” Mumm said. Conservation rates must be in flux all the time to adjust to new patterns of usage, he said. Eventually, the rate starts to work, and there’s a decline in use. In some cases, a decrease in water use is bad for business. Detroit lost nearly half of its population in the past 50 years. The city’s water and sewage department, the third largest water and wastewater utility in the country, upped water prices to make up for the loss of residents. As a result, people used less water – roughly 25 percent less in the past several years, said George Ellenwood, Detroit Water and Sewerage Department spokesman. Now the city faces rising water rates again to make up for the lack of use. Most of the money goes towards maintaining pipes and fixing leaks, Ellenwood said. “So often communities take the path of least resistance and avoid replacing infrastructure as a way of keeping rates artificially low. With any water and sewage system, part of the responsibility is to maintain infrastructure that delivers the services provided,” he said. With the exception of Indianapolis, Ind., Detroit has the highest fixed charges of the 32 cities surveyed by Great Lakes Echo. 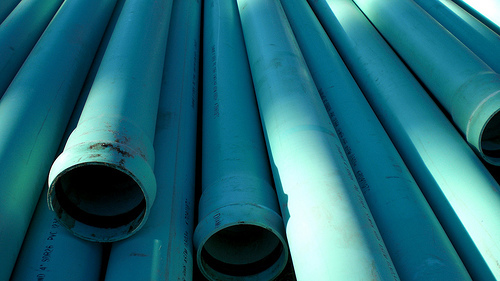 Fixed charges are needed to maintain water pipes and other administrative services. Photo timlewisnm, Flickr. But it also has the lowest consumption charges. The largest cities in the Great Lakes have more than double Detroit’s price for the first block of water use. Despite the tradeoffs, some cities require providers to set conservation rates. In 2008, Minnesota required metropolitan areas serving more than 1,000 people to adopt water rates that encouraged conservation. Unlike some cities with decreased demand for water, Minnesota cities with conservation rates aren’t struggling. In fact, the rates have reduced demand and therefore, the need for costly service upgrades, said Joe Richer, a public water supply specialist with the Minnesota Department of Natural Resources. The law applies to all Minnesota cities by 2013, he said. Utility providers set high consumption charges to discourage water use.